Vessel embolization can be a valuable adjunct procedure in transjugular intrahepatic portosystemic shunt (TIPS). During the creation of a TIPS, embolization of portal vein collaterals supplying esophageal varices may lower the risk of secondary rebleeding. And after creation of a TIPS, closure of the TIPS itself may be indicated if the resulting hepatic encephalopathy severely impairs mental functioning. The Amplatzer Vascular Plug (AVP; AGA Medical, Golden Valley, MN) is well suited for embolization of large-diameter vessels and has been employed in a variety of vascular lesions including congenital arteriovenous shunts. Here we describe the use of the AVP in the context of TIPS to embolize portal vein collaterals (n = 8) or to occlude the TIPS (n = 2). Portal vein collaterals supplying esophageal varices may give high risk for secondary rebleeding. Those collaterals might require embolization to decrease this risk, despite transjugular intrahepatic portosystemic shunt (TIPS) placement. 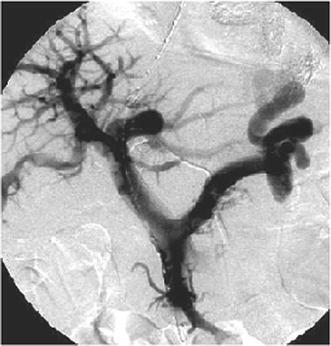 Embolization of the collaterals may be particularly difficult when these vessels are large. Moreover, after creation of a TIPS, closure of the TIPS itself may be indicated when hepatic encephalopathy severely impairs mental functioning. The Amplatzer Vascular Plug (AVP; AGA Medical, Golden Valley, MN) is a device well suited to embolize large vessels and has been employed in a variety of vascular lesions such as pulmonary arteriovenous malformations and congenital shunts [1, 2]. This report describes the use of the AVP in the context of TIPS to embolize portal vein collaterals (n = 8) or to occlude the TIPS (n = 2). Eight patients were referred for TIPS, seven because of multiple recurrent bleeding episodes from esophageal varices (n = 5), gastric fundus varices (n = 1), or both (n = 1) that could not be managed by endoscopic therapy. One other patient (n = 1) was in hypovolemic shock because of recurrent massive bleeding from rectal hemorrhoids. Three TIPS procedures were elective and five were done as emergency procedures for uncontrolled bleeding after initial hemodynamic stabilization had been achieved using blood transfusions, endoscopic treatment, intravenous octreotide infusion, and/or placement of a Sengstaken double balloon tube, alone or in combination. TIPS procedures were carried out under general anesthesia. As an adjunct procedure, we obliterated the portal vein collaterals supplying the bleeding varices using AVP embolization (Figs. 1 and 2). This was done either before or after creation of the TIPS based on operator preference and clinical circumstances. Embolization early in the procedure with early control of the potential bleeding site was considered relevant in emergency procedures in hemodynamically unstable patients. Also, at least theoretically, AVP embolization may be done more easily prior to TIPS whenever the collateral target vein is still widened because of portal hypertension and easily opacified because of preferential flow. After the creation of a TIPS both these phenomena may have been altered. Whenever AVP embolization preceded TIPS placement, the guiding catheter for AVP delivery was introduced transhepatically into the right portal vein. At our institution the portal vein is routinely catheterized prior to TIPS with a 3- or 4-Fr catheter to visualize the portal vein as a fluoroscopic target for transjugular transhepatic puncture. For transhepatic AVP placement this catheter was exchanged for a 6- to 8-Fr hepatic introducer sheath. After AVP embolization and initial creation of the hepatic-to-portal vein shunt tract for TIPS, the hepatic introducer sheath was withdrawn in multiple small successive steps over the course of the remainder of the procedure, so that a solid sealing clot could form in the hepatic parenchymal tract. No additional embolization of the tract was performed. Whenever vein embolization was performed after the creation of a TIPS, AVP placement was done via the transjugular route. 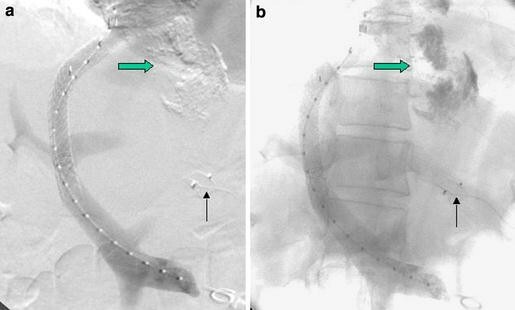 In all patients, the large-diameter coronary/gastric vein supplying extensive esophageal/gastric varices was embolized using a single AVP plug 10, 12, or 14 mm in diameter. For placement, a 6- to 8-Fr guiding catheter was first negotiated into the proximal part of the coronary vein. Then the AVP device was advanced through the guiding catheter and initially deployed by retracting the guiding catheter but without detaching the device. A control injection was made, and if needed, the AVP was retrieved into the guiding catheter and repositioned. When in a satisfactory position, the AVP was detached by anticlockwise rotation of the AVP guide wire to unscrew it from the AVP device proper. Within minutes of deployment, the collateral flow through the coronary vein had completely stopped. TIPS creation was done by placement of e-PTFE-covered stent-grafts (Viatorr; Gore, Flagstaff, AZ) 8–10 mm in diameter and 6 ± 2 cm long, resulting in a postprocedural portosystemic pressure difference of 5–10 mm Hg. All patients were hemodynamically stable immediately after the procedure. During follow-up there were no recorded episodes of rebleeding with a follow-up of 1 year maximum. The patient who was treated for bleeding rectal hemorrhoids died after 3 days because of combined liver and respiratory failure. Another patient who received emergency TIPS while in hypovolemic shock due to massive unstoppable bleeding from esophageal varices died 46 days after the procedure because of liver and kidney failure complicated by ileus. A 47-year-old male was referred for closure of a TIPS that had been created 3 years earlier for alcoholic Child A liver cirrhosis with recurrent episodes of esophagus variceal bleeding. He now presented with problems of amnesia, difficulties concentrating, and a general, overwhelming feeling of tiredness. Spectral EEG findings were consistent with grade 2 hepatic encephalopathy. The symptoms had not improved using conservative treatment. At angiography, a patent TIPS was seen, with a portosystemic pressure difference of 10 mm Hg. Closure of the TIPS with a 14-mm AVP device (Fig. 3) resulted in a dramatic improvement in cognitive functioning and normalization of the spectral EEG. Two years after closure of the TIPS, the patient is still free of variceal bleeding. Recently, however, he developed esophageal varices grades I–II, which are currently treated with band ligation. This will be repeated every 2 weeks until complete obliteration. Another patient, a 65-year-old male, had been referred for TIPS placement for refractory ascites following liver transplantation, which required weekly paracentesis. In the days following placement of a 10-mm-diameter e-PTFE-covered stent-graft TIPS, liver failure developed, necessitating its closure. Closure of the TIPS was technically successfully achieved using a 16-mm-diameter AVP but did not substantially improve the clinical status. Because of liver failure and refractory ascites, the patient underwent a second liver transplantation 2 days after TIPS occlusion. 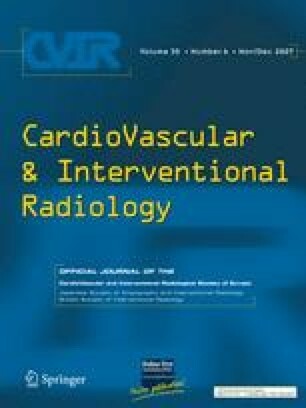 In this report we have described the use of AVP embolization in the context of TIPS. For closure of collateral veins supplying bleeding varices, we consider the AVP a useful device in a defined subset of patients. The AVP’s relative advantages are its efficiency to occlude large-diameter vessels in a single-step procedure and its reliability of placement. Unlike standard embolization coils, the AVP can be positioned precisely, its position can be checked with contrast injections before actual detachment, and it can be repositioned if required. Migration of the AVP during or after deployment is unlikely. Disadvantages of the AVP include the higher cost of the device itself and of the additionally required guiding catheter. Furthermore, the 6- to 8-Fr guiding catheter markedly increases the bulk of the introducer system relative to the 4- to 5-Fr catheter alternatively used for coil embolization. In our practice we are inclined to use the AVP whenever there is a single, large-diameter collateral vein which would otherwise require the insertions of multiple embolization coils and/or whenever accurate placement of the embolic device close to the portal vein may be critical. Embolization of portal vein collaterals to esophageal varices may be indicated even after successful portal venous decompression by creation of a TIPS. Especially in the life-threatening emergency situation of acute esophageal bleeding in hemodynamically unstable patients, we feel more confident providing additional control of the bleeding site by hemodynamically separating the weak-walled varices from the high-flow and potentially high-pressure portal venous bed. TIPS has proven efficient in the secondary prevention of variceal bleeding but this protection is not absolute. The rebleeding rate of TIPS alone (without embolization) has been reported as between 9% and 40.6%, with a median of 18.4% . These values apply to bare-stented TIPS and initial experience suggests that the rebleeding rate is lower with e-PTFE-covered stented TIPS . Whether or not performing embolization of the portal vein collaterals as an adjunct procedure provides additional protection against rebleeding is unknown. Under the assumption that it does, we routinely combine TIPS with embolization of all venous collaterals supplying the esophageal varices when creating a TIPS in the context of variceal bleeding. Another potential use for the AVP device is for closure of the TIPS itself, in circumstances where hepatic encephalopathy and/or liver failure because of the shunt may prove to be life-incapacitating. Here, the effectiveness of the AVP in occluding large-diameter high-flow vessels, its resistance to migration, and its ease of placement are particularly helpful. A potential concern when occluding a TIPS is the acute increase in portal venous pressure, which can lead to recurrence of variceal bleeding and ascites and, also, to hemodynamic changes with increased cardiac loading . As mentioned, we routinely place a transhepatic catheter into the portal vein as a target for puncturing the portal vein during TIPS creation. In our experience, this increases the control over the exact entrance point into the portal vein and also reduces the number of puncture attempts while creating the TIPS tract. We have found that the reduced procedure time for the TIPS procedure proper more than makes up for the extra time it takes to insert this initial transhepatic catheter into the portal vein. We have encountered no complications because of this approach in more than 100 TIPS procedures. To our knowledge, this is the second reported use of the AVP in the portal venous system. In a recent case report, Kessler and Trerotola described a patient with gastric varices and TIPS in whom they used the AVP device for transhepatic obliteration of the portal vein collateral supplying the varices , a patient similar to one of our patients with flow-mediated gastric varices. We would like to emphasize that the AVP may be considered also for embolization of the more common collateral veins to esophageal varices and, if need be, the TIPS stent itself.